In anticipation of tomorrow night's #SocialTech discussion about Instagram at Keystone Art Lab, I've decided to compile some tips I've learned along the way. Instagram can be a great tool for small businesses & creatives because it really helps with getting your work out there and attracting a following (and even better, a growing community of friends). While I wouldn't necessarily call myself an Instagram expert, I have been doing a lot of research on this topic lately. So far, some small changes have really helped my account (based on my numbers, at least), so I figured I'd share. If you're trying to take your Instagram account to the next level, keep some of these tips in mind! Since Instagram is all about photos, consider using (or learning) some basic photo techniques to capture compelling images. Some key things to keep in mind include lighting (natural usually works best) and composition. Take your photos from a few different angles and play around with small changes that can improve your shot. Since you'll be cropping your images down to a square, try to consider that aspect ratio while shooting. For example, a wide panorama won't translate well into Instagram, so try to capture your view in a different way. When taking photos, also try to consider if you would "like" the images you're taking if they popped up on your feed. Try to be prudent in your selection to only choose your best photos. It's easy to want to share everything but having a curated feed of fewer great photos is always better than having a ton of mediocre photos. Even if you do your best when capturing your images, it's always worth improving them in a photo editing app afterwards. It's amazing what a few tweaks to brightness, contrast, saturation, and hue can do. Messing with those four things can really make a photo go from good to great. I edit every single photo of mine and often turn up brightness, contrast, saturation, and warmth to get the look that I want. I also try to crop my images with purpose and sometimes scale or straighten them to improve the composition. I'll apply a filter as well if any of them actually improve the look of my image. The editing choices you make really come down to personal preference and the look you're trying to achieve on your account. And don't worry, once you figure out what works for you, editing your photos really only takes a matter of seconds. While Instagram does have some pretty good photo editing features in the app, I almost always bring my photos into VSCOcam to give them that extra pop. Sometimes I'll do a little more in the Instagram app afterwards, but the majority of my edits happen in VSCOcam. Which brings me to...your color story. Depending on your brand (yes, even if you're just one person, you have a "brand"), you may naturally gravitate towards certain colors or types of images. 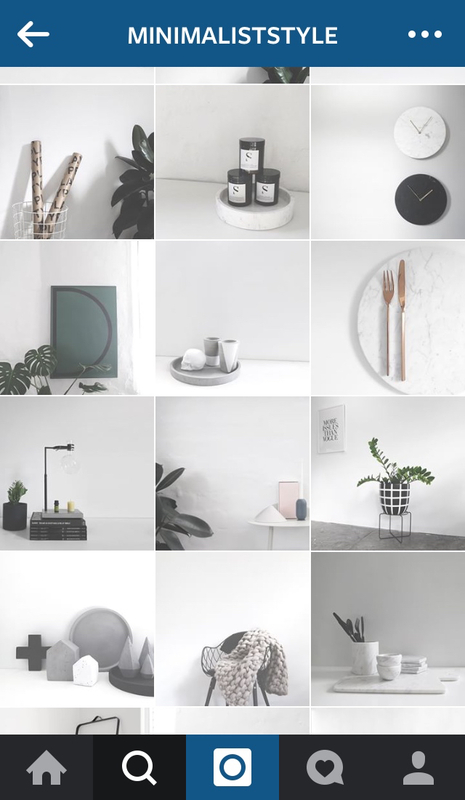 Some Instagram accounts do a really good job at being super consistent with their images - going for a washed-out neutral look, sticking to only pastels, or going bold and bright. My images are all over the map with the tiki, design, and life stuff I post. Generally, I think of tiki as very warm & colorful so I try to have a feel to my feed that's got a little bit of a saturated variety to it. If someone can tell what your "brand" is all about based on your first few images, you're doing something right. My Instagram is mostly filled with images that represent the two topics that I'm mainly focused on - design & tiki culture. Even though they're not directly related, I also sprinkle in some images of my life, my dog, my neighborhood, etc. It's worth infusing your account with a few photos that represent you so that followers can "put a face to a name" and, as a result, feel more connected to your brand. I personally like to have my feed look like a checkerboard where the variety is such that images right next to each other are never too similar in color. Semi-neurotic, I know. Totally ignore this tip if it seems like too much. But some of the most followed Instagram accounts do this and it looks pretty cool. Do I stick to this advice all of the time? No! Sometimes I don't really care or I'm not paying that much attention or I really really really want to post something that happens to screw up the pattern. Don't worry too much about it - this is supposed to be fun! I personally prefer to take advantage of the whole square for every post and I avoid borders or splitting images entirely. If you want to use some of those stylistic elements, just try to be consistent - you'll be amazed at how much more "professional" your feed will look overall. This is social media after all! I find the more people I follow or interact with, the more people take a look at my account and follow me back. It's also fun commenting on photos of accounts you follow and starting up mini-discussions. I've managed to interact with a lot of people I've considered "mentors from afar" (or people who I follow that don't really know I exist) and that, to me, is really cool. Another way to stay in touch is to tag other users and accounts with the @ sign (like, @moderntikilounge). I usually do this in the description of a post if I'm at a certain place (@tongahut), with a friend (@tamthyme), or sharing someone else's creative work (@sacha_baumann). This not only gives your followers awareness of other great Instagram users that you like, but it also makes the people tagged aware that you're talking about them. Speaking of talking about people, try to always be positive! Social media is a great place to make friends, grow a community of followers, and support people & businesses that you like and appreciate. At the same time, it is all very public. In my opinion, the more love, the better (or, if you have nothing nice to say, don't say it at all). It's so easy to leave that little bio portion blank at the top of your Instagram feed but it doesn't take too much effort to fill it in. Try to summarize who you are, what your brand is about, or what you're up to in those few characters they give you. Just as viewers will skim your first few images up front, they'll also look to your bio to clue them in to your account. I feel like mine's not perfect but it's a start. Oh, and if you've got a website, be sure to feature it as a link! I constantly reference my website in the captions of my photos that refer to my latest blog posts. It's great for my followers to be able to easily click that link to get access to the latest up on my blog. 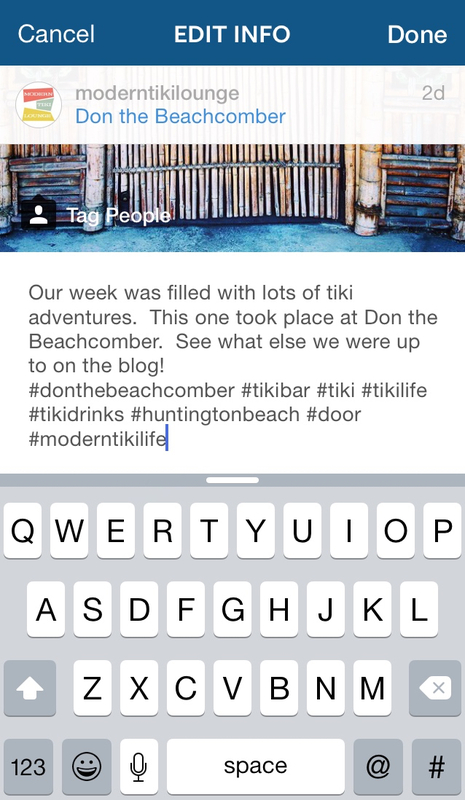 For Instagram beginners, it's good to know that by using a #hashtag you're making your posts searchable. Click on a hashtagged word/phrase and you'll see that you can view all of the photos that have recently been posted with that hashtag. This is great when you're in a certain location, at an event, or are looking to attract people who might be interested in your photos. I'm constantly using #tikidrinks and #midcenturymodern on my photos (when they apply to the images of course) so that like-minded people can stumble upon my posts and my account. Sometimes it's also valuable to come up with your own unique hashtags so that followers can see a grouping of similar photos that you've posted. I'm sure some of you have seen this at weddings or special events (#tikioasis2014). It helps to compile all photos specifically posted for that event or about that topic into one organized feed. Right now, I use #MTLgats for all of my posts that feature my dog, Gatsby. If my followers are interested, they can see all photos of him at once simply by clicking on that hashtag. I really feel like most people are unaware that you can edit the text in the captions of your photos after they've been posted. This means, you can fix typos, add or remove hashtags, tag other users, etc. This has helped me improve the quality of my posts so many times especially when I've noticed that I've screwed something up! So how do you do this? Go to your post. Right below the image there will be a heart ("like" button), text bubble ("comment" button) and three dots in a row (...). Click those three dots and you'll see that you have the options to delete, edit, or share. I usually only use "delete" if I'm not happy with the image quality (since photo edits, unfortunately, can't be made after the fact). When you need to fix your image caption, "edit" is your best friend! While all of these tips may make Instagram seem more like a chore than it's worth, they most definitely will not make or break your account! Sharing your story with the world can be done in so many ways and you're already on the right track if you've decided to put yourself out there. Gradually work towards making improvements over time and you should start to notice your following grow. And what if you feel like your account doesn't look amazing at first? Guess what? No ones does! Everyone improves incrementally as they become more experienced with the app, so don't sweat it! Overall, enjoy the fact that Instagram is an easy tool that helps you paint a picture of your brand while making new friends, discovering other like-minded people, and stumbling upon endless sources of inspiration. Most importantly, have fun!! On Instagram? Follow me @moderntikilounge! If you're in the LA area and would like to join the conversation, swing by Keystone Art Lab for the #SocialTech discussion (7pm this Wednesday). It's going to be a great group with experience ranging from beginner to near-expert. I can't wait to hear what other tips people will have to share! And, of course, if you're looking to join the conversation remotely, please share any questions or tips you have in the comment box below!